Hopefully by now it is obvious that having obsessive compulsive disorder makes being an active Mormon a little bit more difficult. Not that it is more difficult to keep the commandments or anything like that, but more that it makes it difficult, for me at least, to feel like I am doing enough, being enough, etc. In other words, OCD concerns often make me feel “unworthy.” We talk a lot about worthiness in the Church. Are you worthy to get baptized? Take the Sacrament? Use the priesthood? Be healed? Go the temple? Receive answers to prayers? Etc. etc. Maybe this pressure is a little bit overemphasized or maybe it’s good to be constantly trying to achieve greatness. We are also told, of course, that worthiness isn’t the same as perfection but sometimes it’s hard to really embrace that idea or to say in our minds, “Okay, cool. But how not perfect am I allowed to be and STILL be worthy?” See what I mean? It gets tricky. Sometimes it is incredibly hard. Sometimes I feel like I’m a sinner and am faking it in front of everyone. But I’m not sure if that’s me or the OCD talking. Maybe it doesn’t even matter. Maybe I will be struck down after I die. But probably not. Before I went to the temple for the first time to receive my endowment, I was having serious concerns. I really thought that I wasn’t perfect or worthy enough to go to the temple. 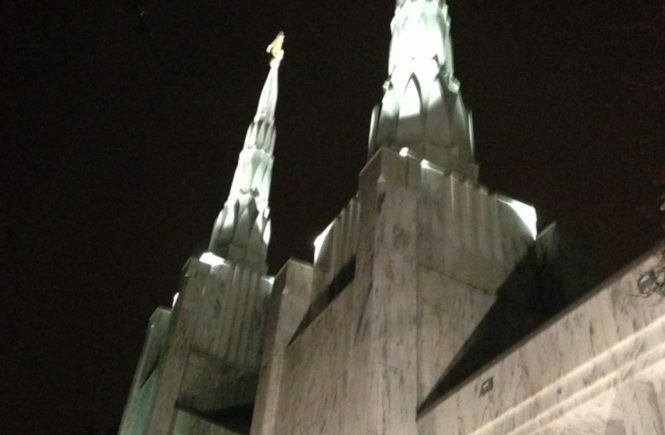 I didn’t want to make a big mistake and go through the temple when I wasn’t ready or worthy to do so. Maybe I hadn’t repented enough. Maybe I would be screwing myself over eternally by doing this. I remember driving from Nevada to California with these concerns, not knowing what I should do. The whole “put on thy garments” bit really got me, since it is in the temple before receiving our endowments that we are first instructed about and allowed to wear the garments. I really had felt “confounded” and knew that this scripture was my answer. I needed to go and make covenants with God in the temple. I needed to remember that I wasn’t perfect and was only going to “be perfected in him.” We like to talk about grace vs. works and believe that works are essential, but grace is too. It’s not either/or. It’s worthiness, not perfection–even if that’s hard to remember and understand sometimes. Have you struggled with OCD and worthiness too? How do you overcome it? I think you nailed it. If someone is the least but conscientious in the church they’ll have your same thoughts. I know I do and maybe that’s because we’re related. Anyway good post this one is.